If you prefer a version that is quicker and easier to build, but which doesn't have quite the same final appearance I highly recommend the Breadboard Six Transistor Radio Kit. It is also slightly cheaper. Paper documentation is not provided. 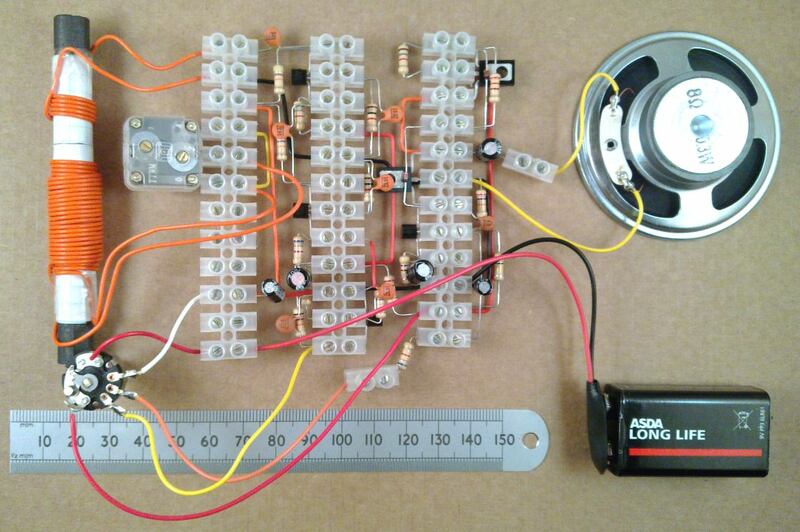 Here is a link to a YouTube Video Demonstration of the Complete Choccy Block Radio Kit. 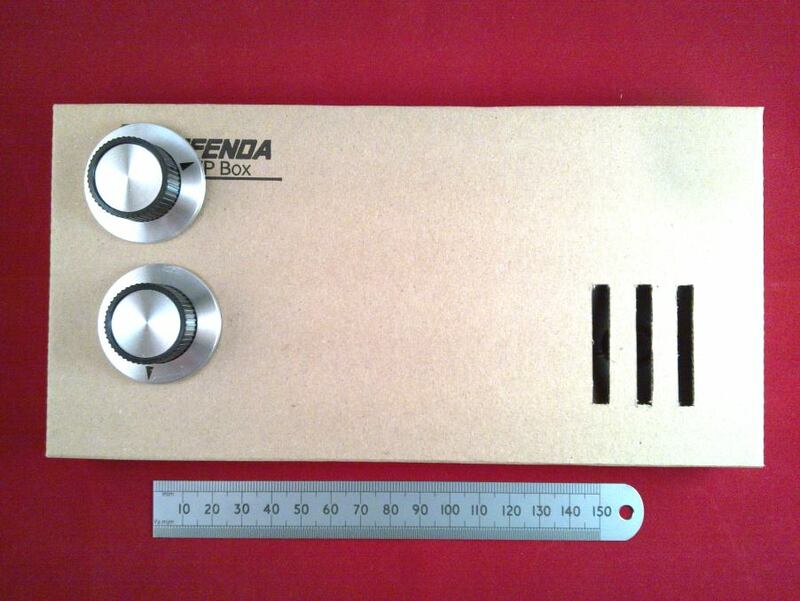 This is a MW AM transistor radio which can be constructed without soldering using 3A terminal strip. It is a modern response to the 1971 Ladybird Book Radio and works as well as some AM radios that you could buy in a shop. It's best to read right through the construction notes first before starting out. Why is it called a Choccy Block Radio Kit? Choccy-Block is the nickname for the terminal strips on which it is constructed, and they look rather like chocolate bars. 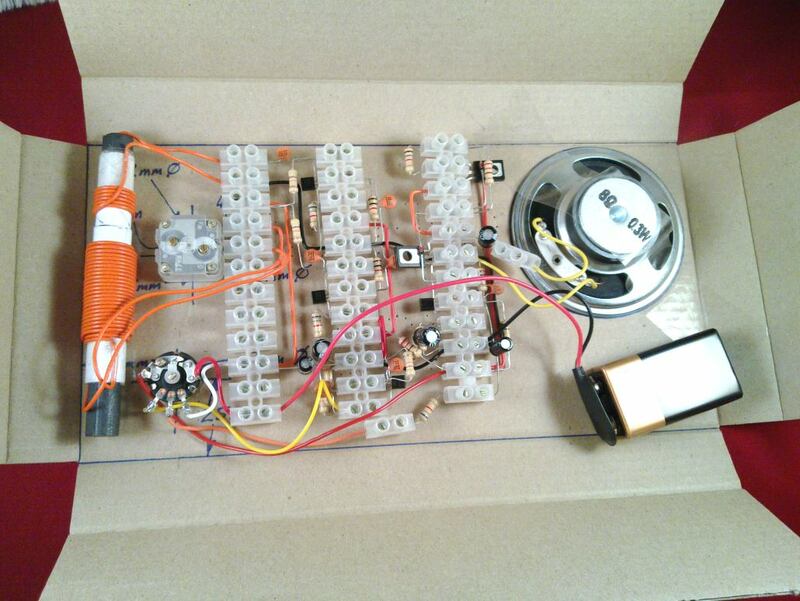 I supply a kit of all the electronic parts, wire, terminal blocks, knobs, mounting screws and a cardboard enclosure for this design with wires soldered on to some parts where necessary. I've assumed that you have a small screwdriver for the terminal screws, a fine point marker pen, some small wire cutters for trimming the component leads and some means of stripping the insulation from the wire. A craft knife is good for that. You will also need some paper, glue, scissors and sticky tape. It is best to mount up the radio in an enclosure when it is all working. The cardboard container supplied is pretty good to start with, or you might choose to use some other method. The components list has links to photographs that should allow you to make sense of the different values and to identify which leg is which. You need to know about resistor colour codes and you can find that information in many places. It should be possible to build the radio just by looking at the pictures, but later on I've included full electronic explanations. If those don't make any sense, don't let them put you off just building the circuit. The schematic diagram can look a bit daunting to the novice. Don't Panic. You don't need to understand it all to make it work. The idea of this design is that if you follow the plan it should work without too much fiddling. Experienced builders will find the schematic diagram helpful as well. 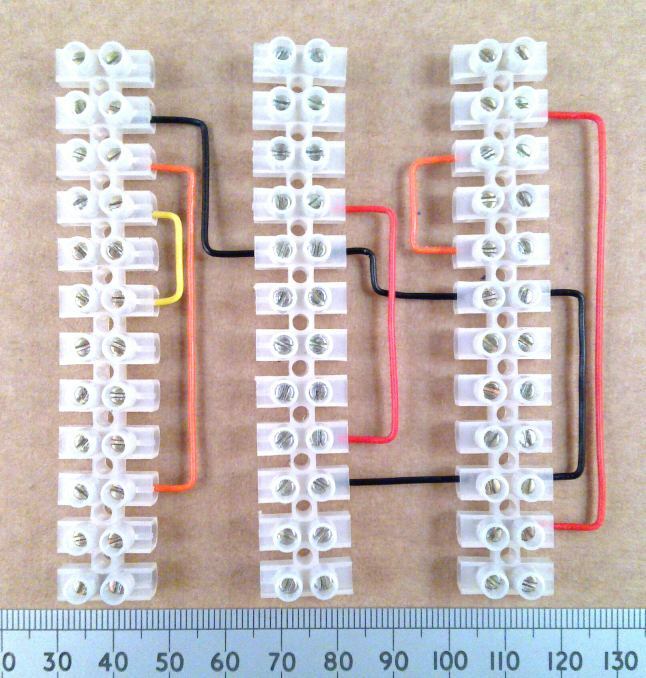 Start by cutting to length, stripping the ends and assembling the single core link wires into the terminal strips as shown. Each wire must have the end stripped of insulation by about 6mm so that the terminal strip screw touches the bare wire. It is best if each wire end is only trapped under one screw on the side which it enters the strip. For now, tighten the screws only very gently, just enough to hold the wires in while you put everything else together. As long as they are in the correct holes, the wires don’t have to be absolutely in the exact shapes shown, but it will make it easier to check everything later on if it’s made just like in the picture. You can click on the pictures to see a bigger version. 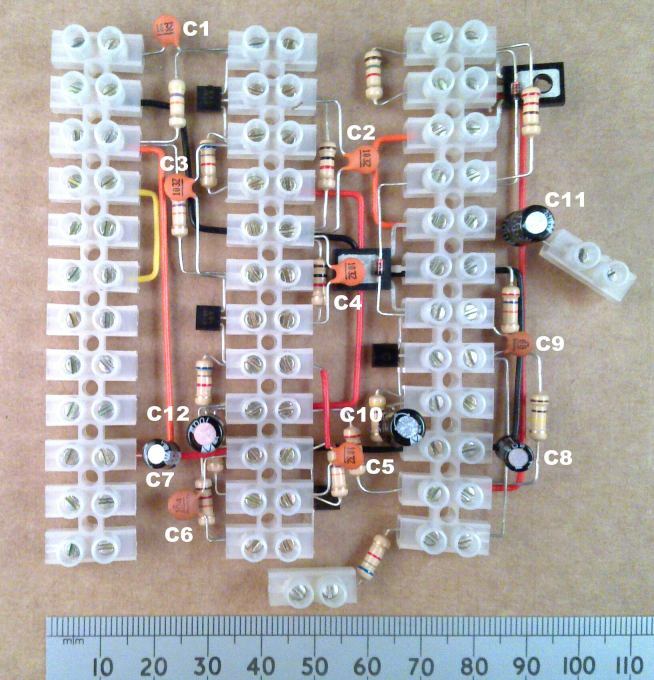 Identify the various different transistors and bend their legs as shown in the BOM pictures so that they will fit into the strips. 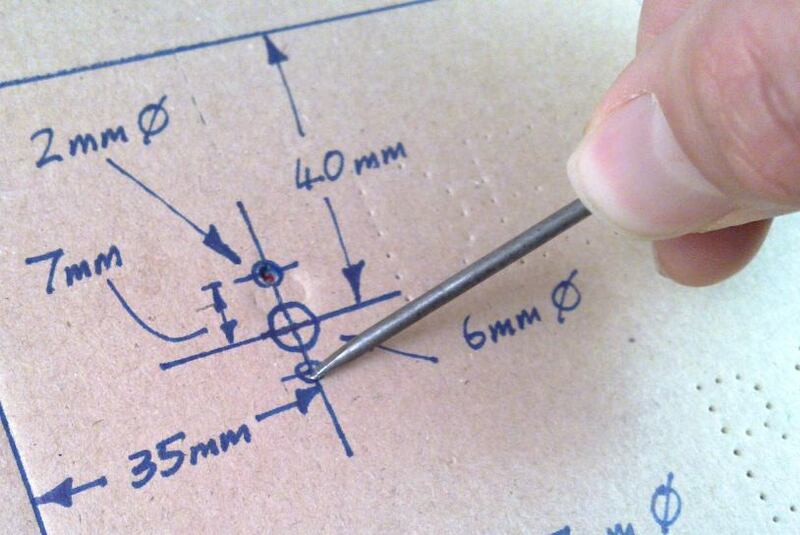 The transistor legs will only bend a few times before dropping off, so it’s best to get it right first time. 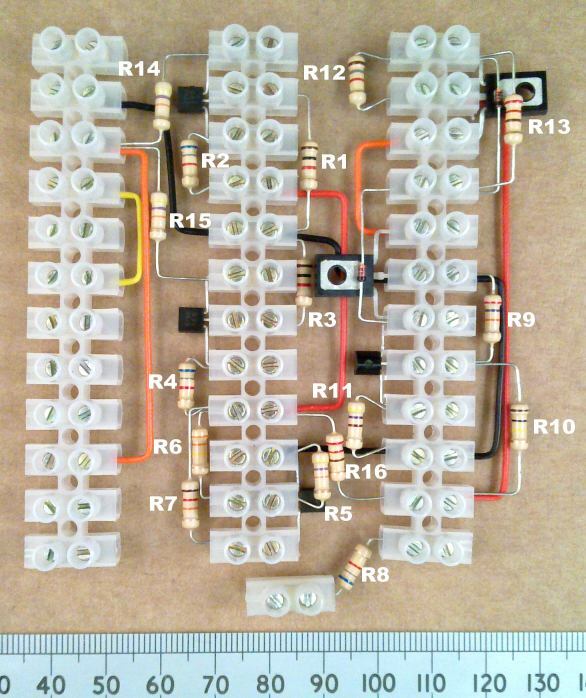 Assemble the two diodes in the positions shown, so that the glass bodies are in contact with the transistors but so that the wires are not touching the metal part. 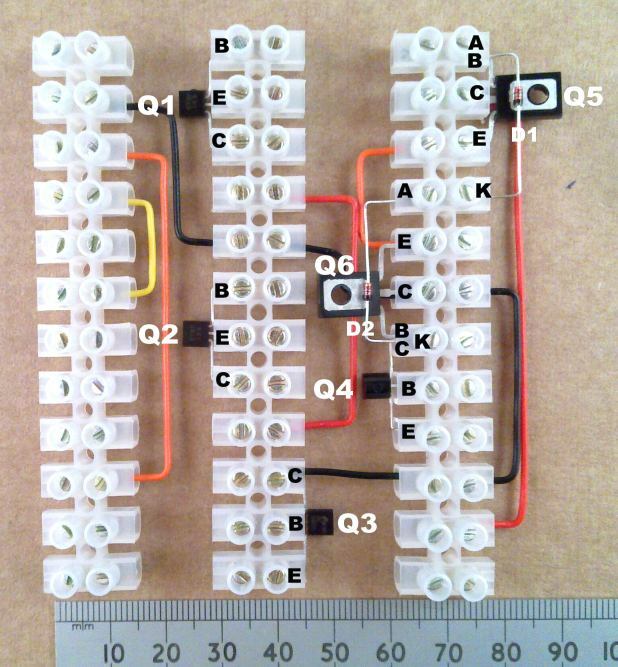 The diodes and transistors have to be connected the correct way round as shown by the identification letters next to the legs. Note that Q4 is connected with the curved side facing upwards and the flat side facing down. Q5 and Q6 may be supplied as fully insulated parts without any metal showing to help avoid shorts. Where this is the case, the side with the lettering on always defines the upper side. They should be fitted with the lettering facing down. You can fit the resistors either way round, but it will be easier to check later if the gold coloured bands are pointing down or to the right. R8 requires an extra loose terminal block to connect it to VR1. In the next stage, fit both the ceramic disc and electrolytic capacitors. 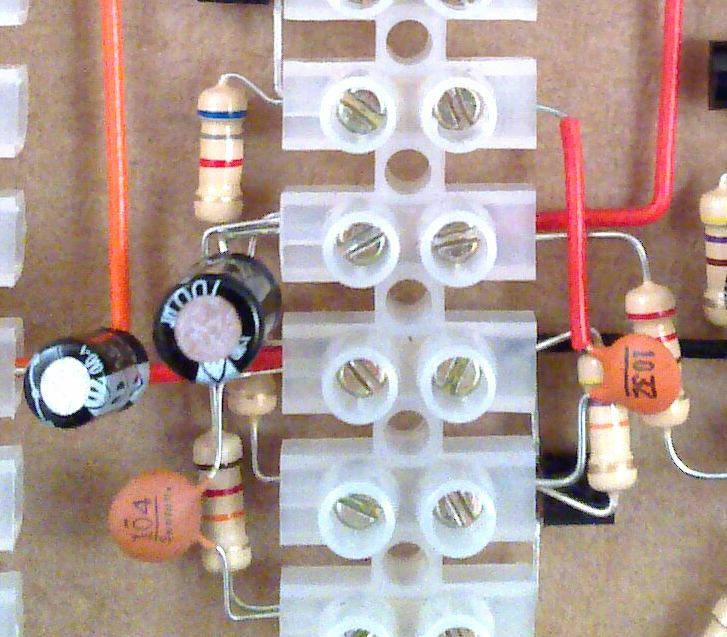 With the exception of the bipolar one, the electrolytic capacitors have to be connected the correct way round. Now that things are getting a bit crowded, you might find that keeping the capacitor wires from touching wires that go into other holes is quite difficult. Where this happens, take some discarded wire stripping and slide it onto the capacitor wires to avoid short-circuits. I needed to do this on C7 and C5, and sleeving the wires of C8 may be a good idea too. If the stripped sleeving doesn’t fit on very easily, try putting a small amount of vegetable oil on the wire first. C11 requires an extra terminal block to connect it to the loudspeaker. 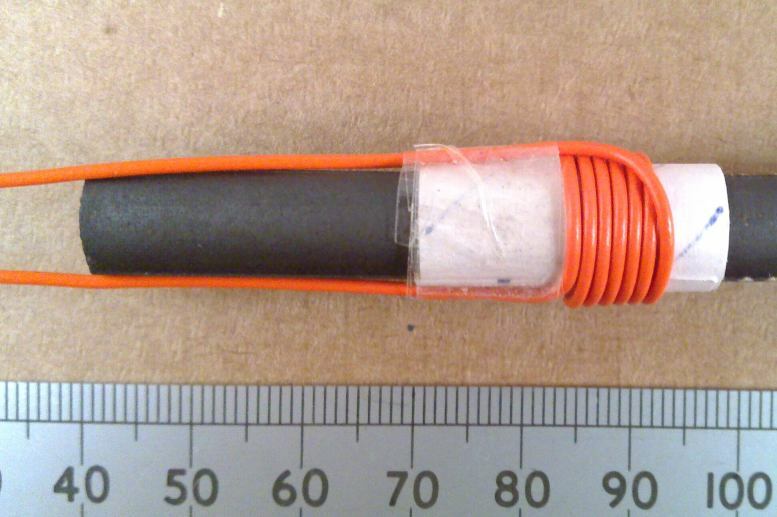 The second picture shows an example of covering one of the leads of C5 where it crosses one end of R16. VR1 comes with wires attached for both the volume control and on-off function. 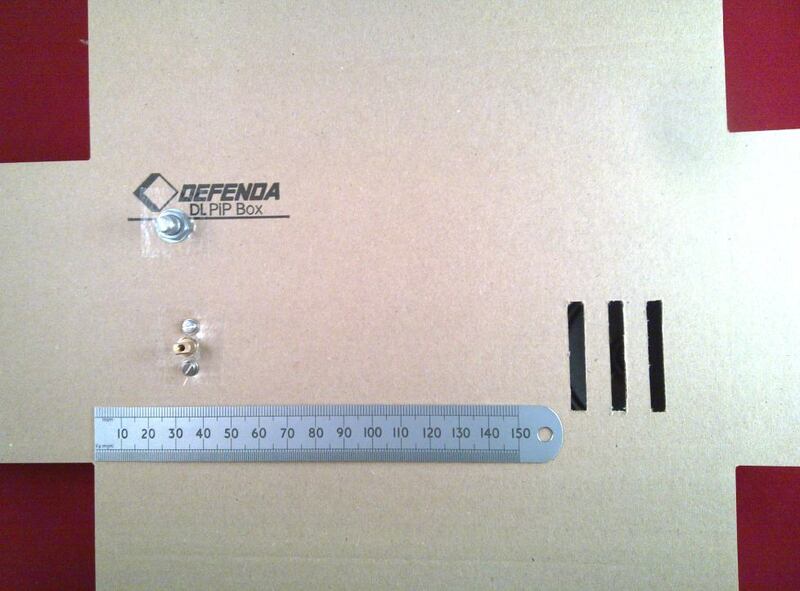 They are longer than needed for the standard construction in case you want to use a different box. 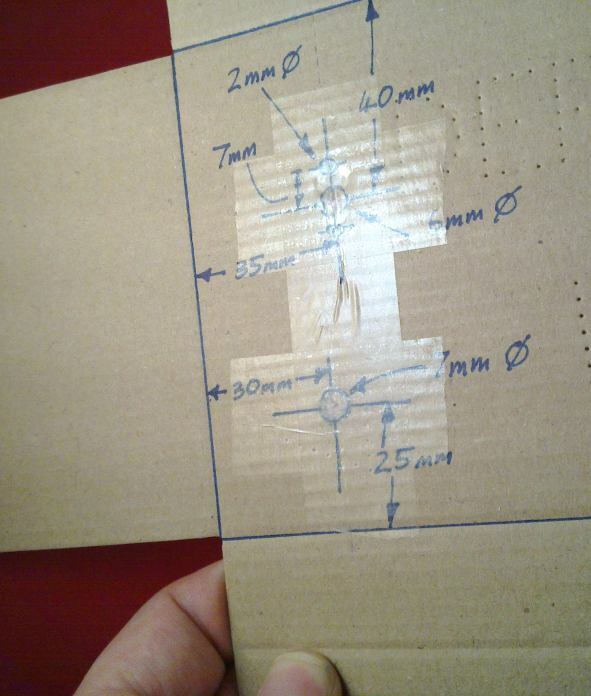 The pictures show them fitted and cut to the right length for the cardboard enclosure. Do the same with the battery clips and the loudspeaker. The connection strips of tuning control VC1 can be bent and connected in so that the shaft points downwards below the level of the terminal strip bottom face. At the end of construction, this will protrude out of the front control panel. The final picture shows the main circuit from underneath, with the shaft of VC1 pointing upwards. 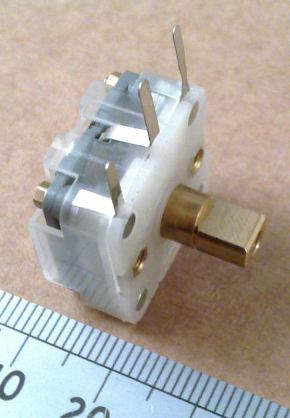 The input coupling coil is the small one which takes the signal from the ferrite rod and feeds it into the radio. This is constructed as follows. 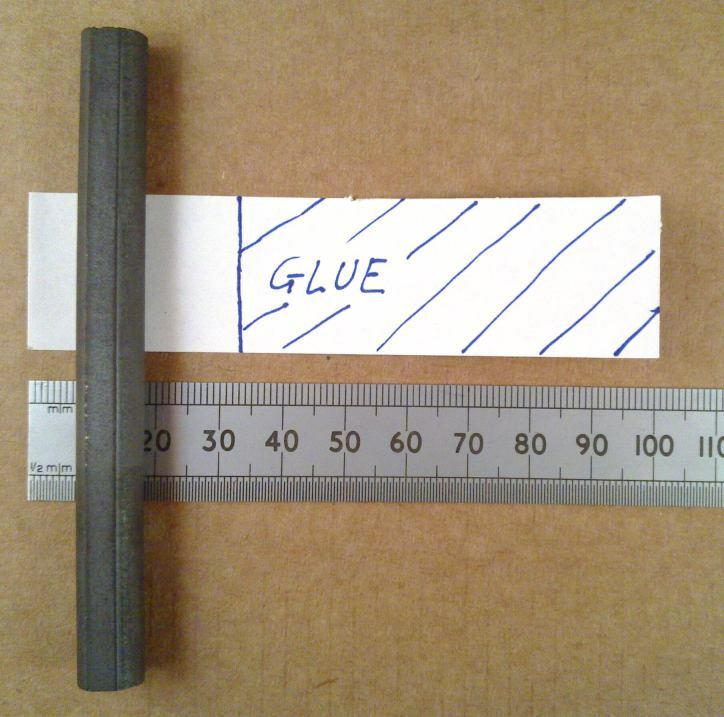 First make a paper tube about 2.5cm long. Use a strip of some normal printer or magazine paper about 2.5cm X 10cm. 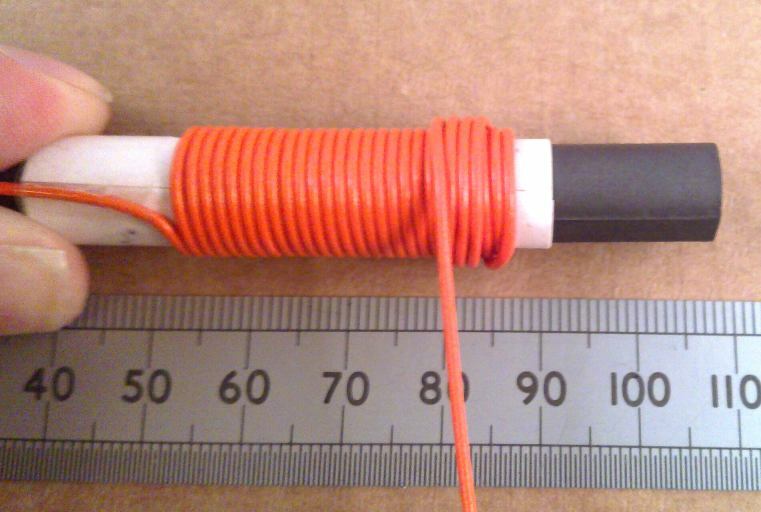 Put stick glue on about 8 of the 10cm length then wrap this around the ferrite rod so that the glue sticks the paper and forms the tube. 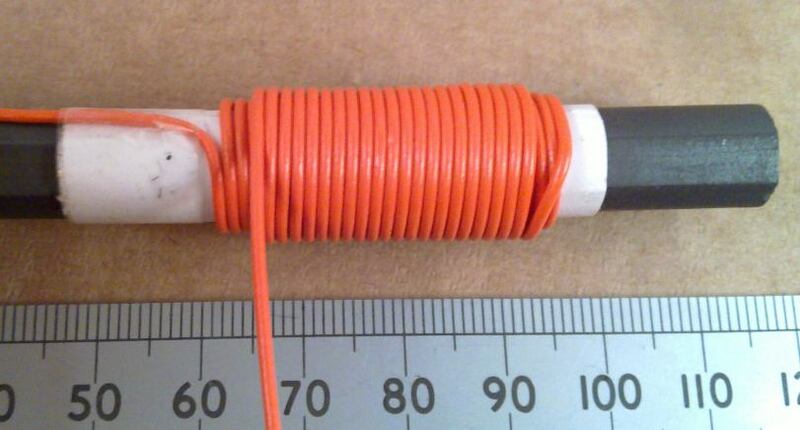 After this has dried, using single core PVC insulated copper wire, wrap 6 turns onto the tube. Secure the start end with sticky tape first and then the far end when it is complete. You can follow the photographs which show this process. 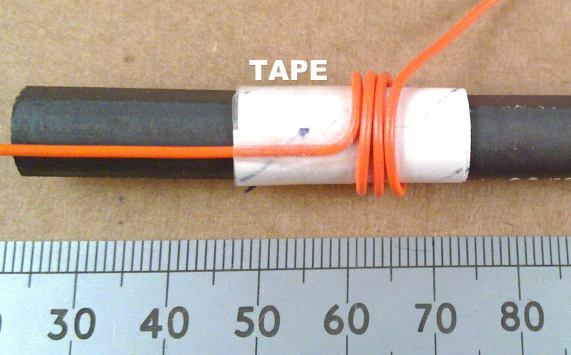 Don't wrap the paper, the wire or the tape too tightly or you won't be able to slide the coil up and down the rod. 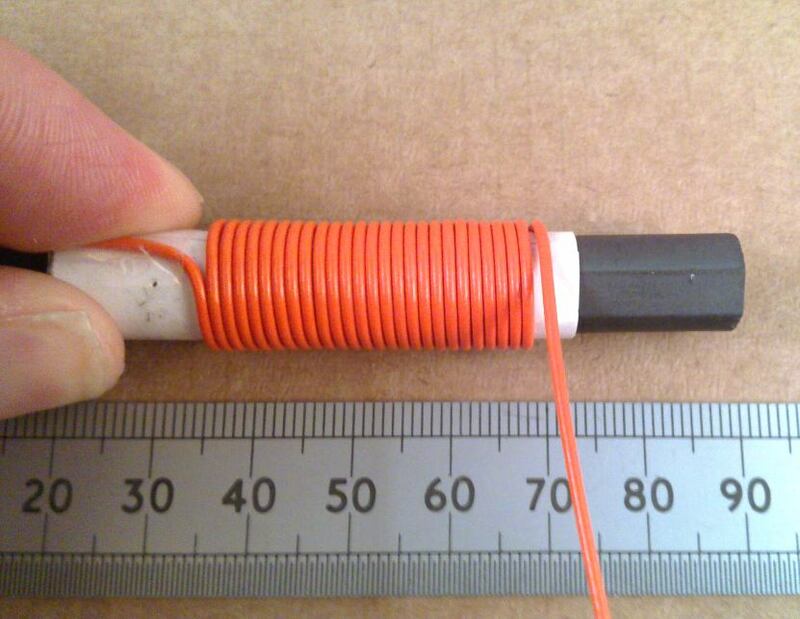 I recommend winding the wire by rotating the rod and former rather than wrapping the wire around. Wrapping it around tends to put a twist in the length of the wire which makes it tangle up more easily. The main MW tuning coil is the large one which is connected to the tuning capacitor. 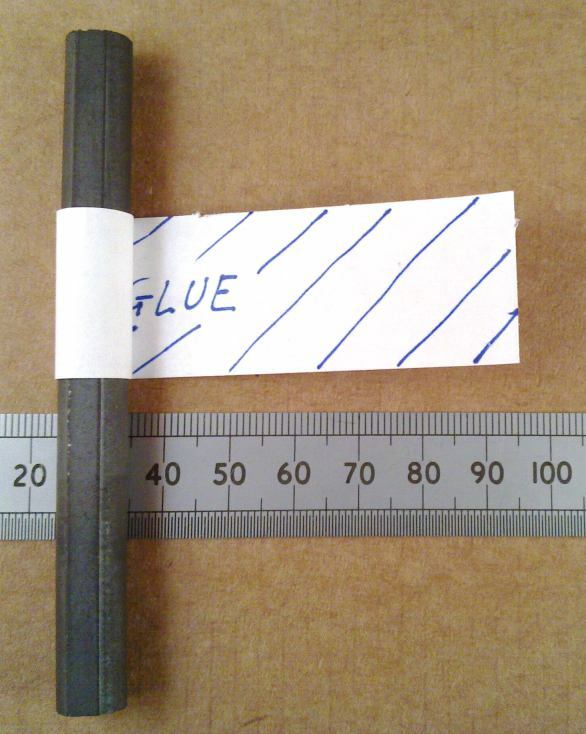 The paper tube for this is made from paper 6cm X 10cm. First wind the coil in one direction across the tube for about 25 turns and then 20 turns over the original turns coming back in the other direction. 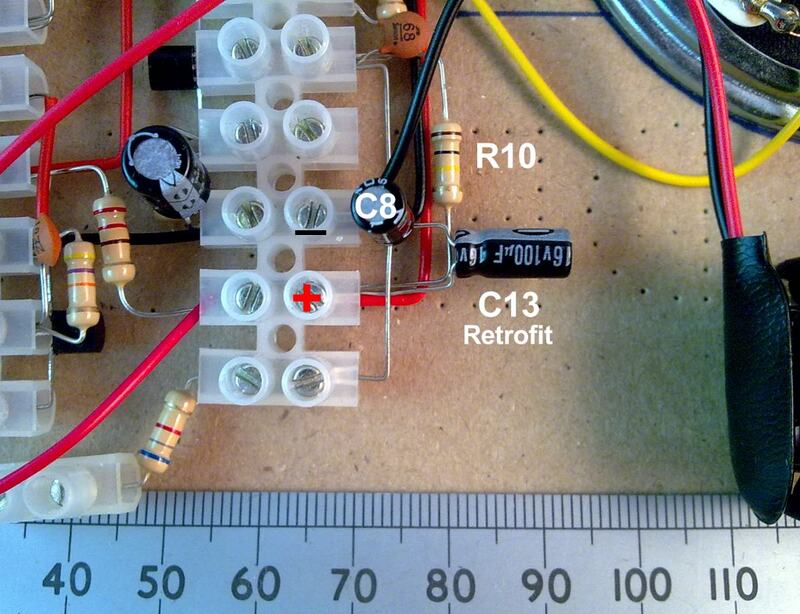 When this is done, connect the large coil to the tuning capacitor connections and the coupling coil into the radio input. If you've gone stage-by-stage and everything is in the right place, it should be ready to go. 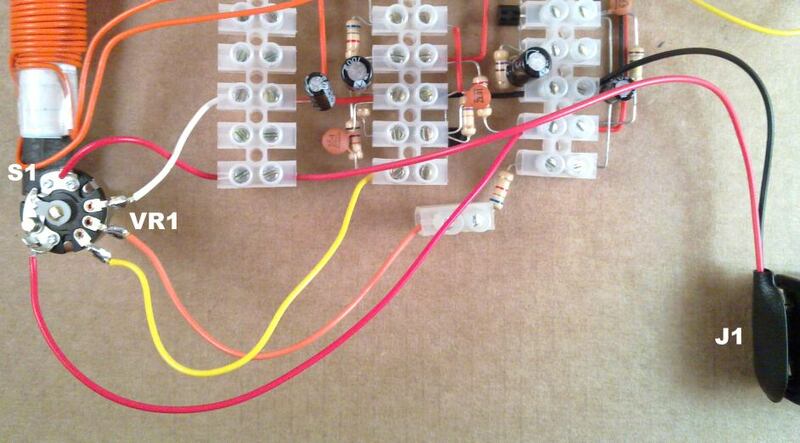 It's worth double checking the direction of the two diodes, the transistors and the electrolytic capacitors. Then go down both sides of each terminal strip checking that they are tightened up enough to hold the wires in but still not over-tightened at this stage. None of the wires should be loose enough to pull out without forcing it. Check that there are no shorts between wires going into different holes. When I first designed this and had taken all the photographs, I had made a mistake. I'd forgotten to put a supply rail decoupling capacitor across the main 9V battery rail, but it made no difference when I added one so I went ahead and published anyway. This is completely fine with alkaline batteries, but when using the older cheap zinc-carbon types you need C13, a 100uF electrolytic capacitor connected as shown in the picture below to act as a reservoir to stabilise the battery voltage. This should always be fitted. Connect the battery and rotate the volume control up to about halfway. Turning the tuning control should immediately allow you to hear the main MW stations. 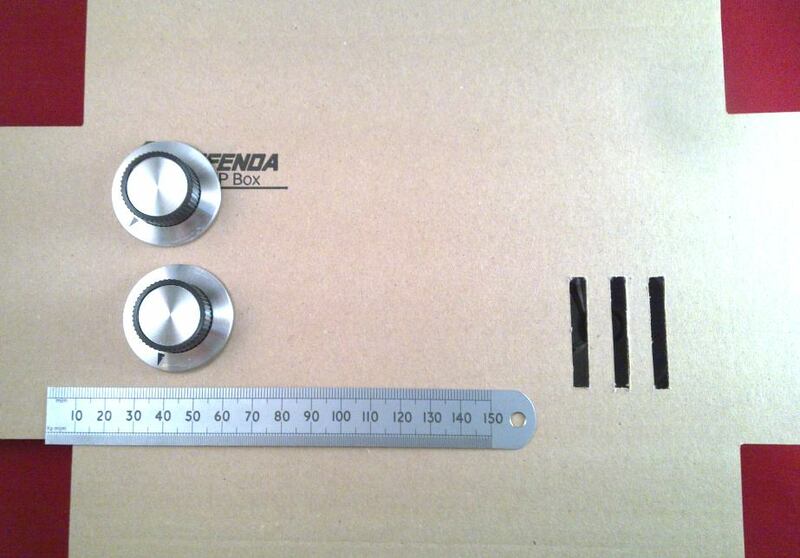 The following pictures show how to put the radio into the cardboard box supplied. 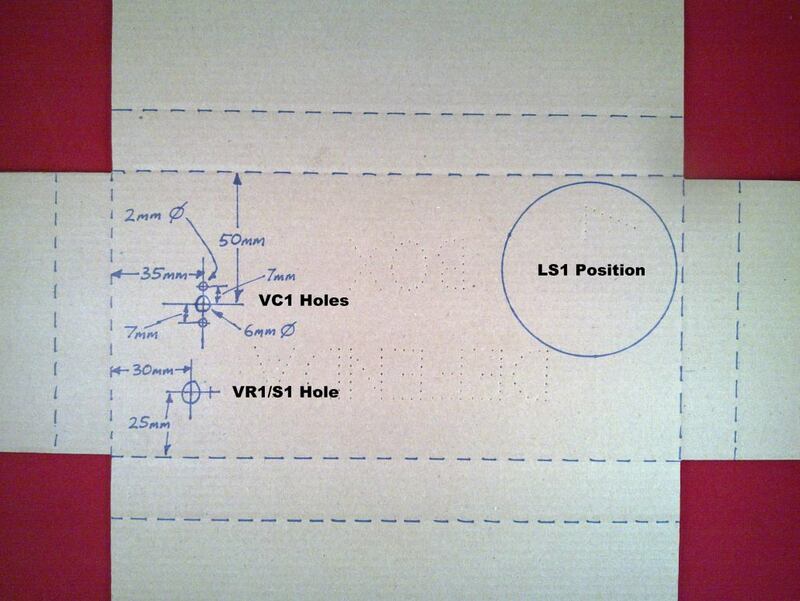 The box should be marked out as shown and holes made in the appropriate places for the volume control, tuning control and loudspeaker. 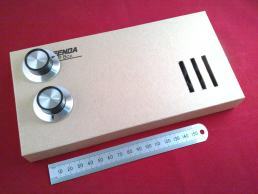 Applying tape to the holes around the volume and tuning controls strengthens the box and the two controls can be fixed quite securely. 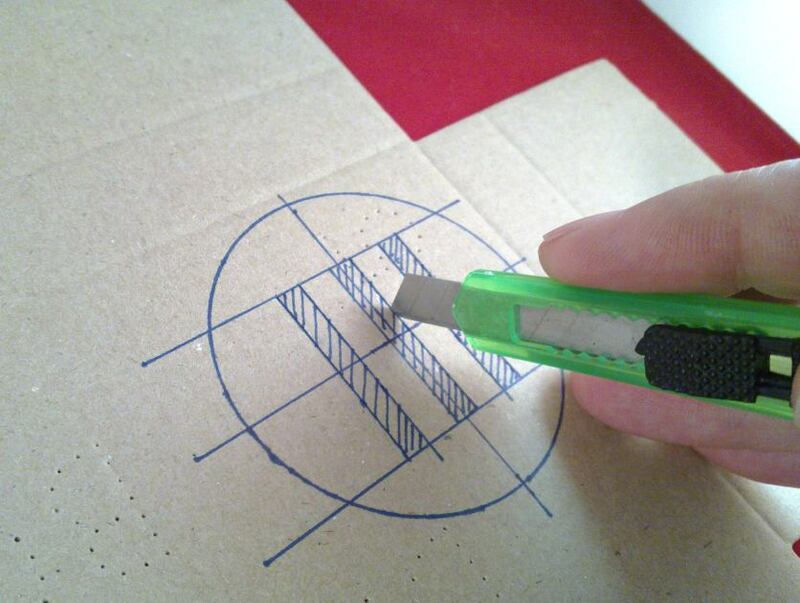 It is good if you can use a pillar drill to make the circular holes neatly, but as it's cardboard it is possible to do it with a screwdriver and scissors as shown. 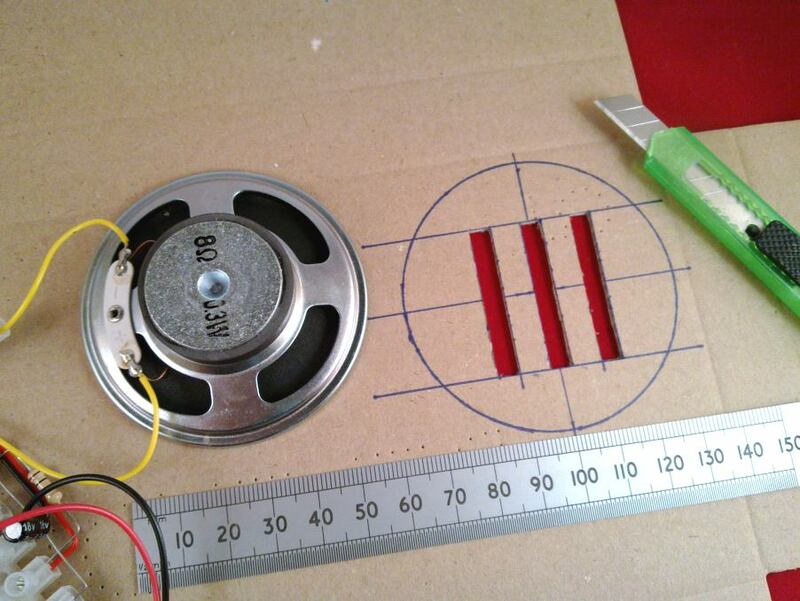 The loudspeaker slats can be cut out with a craft knife or scissors. Craft knives are razor sharp, so use an appropriate level of care. When everything is fitting well, providing everything is still working you can give each of the terminal screws a final tightening, fold up the box and put a couple of elastic bands around it. The side flaps fold over first, then the longer top and bottom flaps fold down over them to meet in the middle. 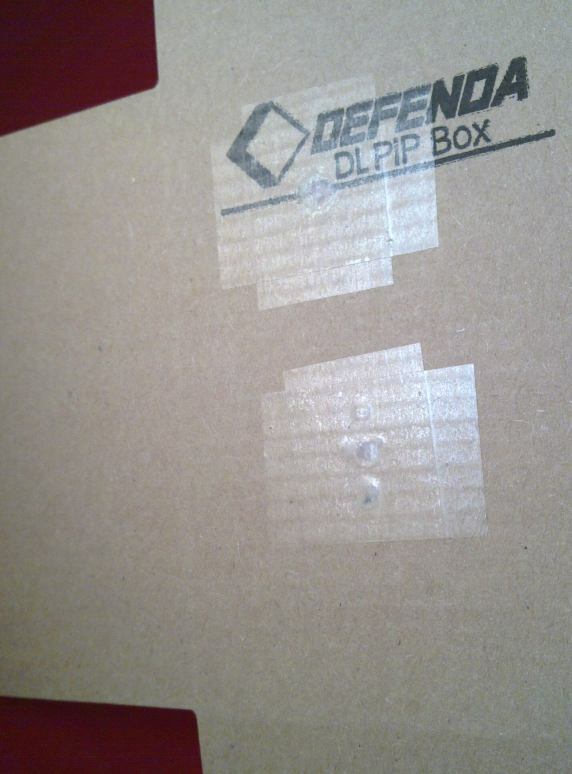 If you tape up the box more permanently, the internal part of the side flap next to the battery can be cut shorter and left untaped to allow that to be opened for changing the battery. I stayed with just the elastic bands, so that it was easier to show the inner workings. Now that it's all together, you can count how many AM stations you can pick up, bearing in mind that the antenna is directional so you have to rotate the radio for the best signal. If you find that you are missing the high frequency end of MW you can move the main tuning coil closer to the end of the rod, shuffling up the coupling coil to meet it. How good is it compared to something bought from the shops? The three models that I have made up are all of identical performance and I think that it compares well with a small shop radio. The tuning is sharp enough to distinguish the three Absolute Radio frequencies of 1215, 1242 and 1260 kHz in Farnborough, Hampshire UK which is good going for this simpler design. There's no need for external aerial wires as with some home constructed designs. 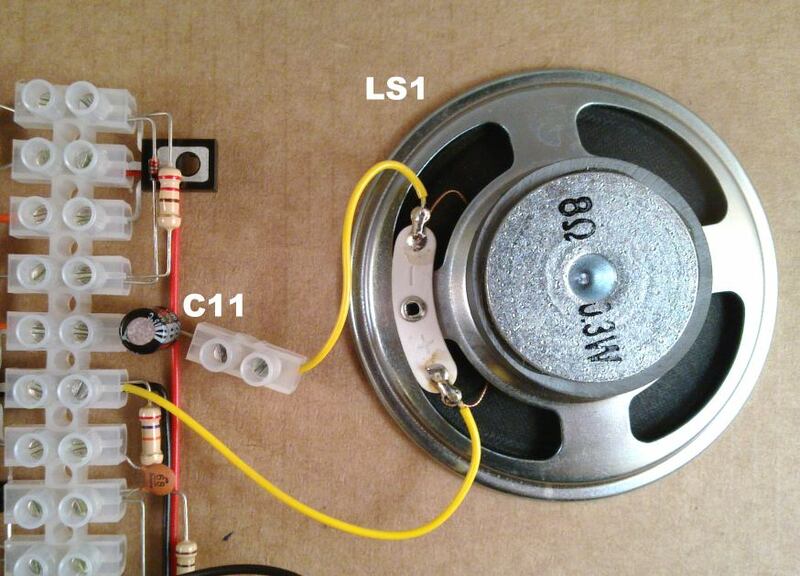 The audio amplifier drives the small loudspeaker to a good volume. Have another look for shorts between components where they are spanning many terminals and where they are close to other wires. If you've got a multimeter, use the 10V voltage measurement range to check around the d.c. voltages when tuned away from a station. 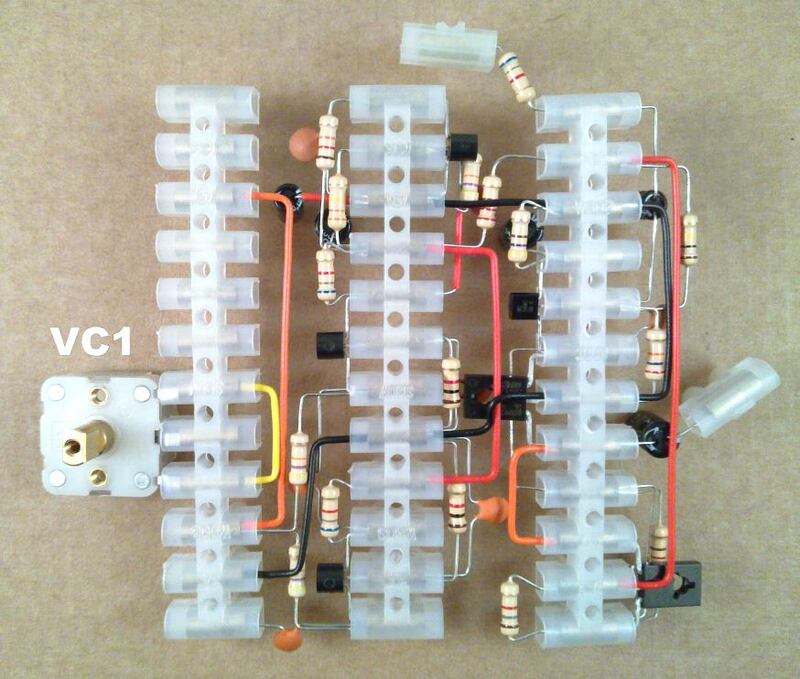 With a fresh 9V battery you should see voltages that are very close to those marked on the schematic diagram. 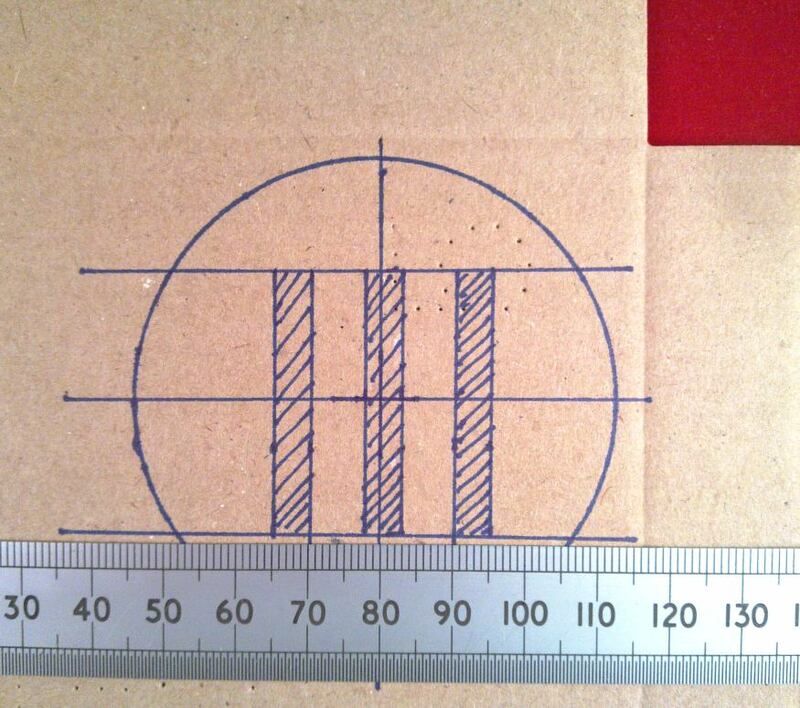 Very close in this instance means within plus or minus 0.3V of the figure in the diagram. The voltages marked on the schematic diagram are measured values for direct connection of 9.0V power with low signal input, all with the negative meter lead connected to the negative battery terminal. If you see a voltage that is more than about 0.3V out either way, then there is probably something wrong in the circuit around that transistor. If all voltages look low, the battery rail is probably shorted out in some way. If you have intermittent operation that comes and goes with vibration or handling, gently prod the various parts of the circuit until you find the sensitive part. There will usually be a wire loose or shorted in that area. The area around Q2 and C5 is quite sensitive to interference from nearby wiring. If you have used a different enclosure, ensure that the wiring in general and the two coils on the ferrite rod in particular is kept physically distant from that area of the circuit. If you find that the radio is working but is very hissy or squeals, try moving the coupling coil up the ferrite rod a small distance away from the main coil. 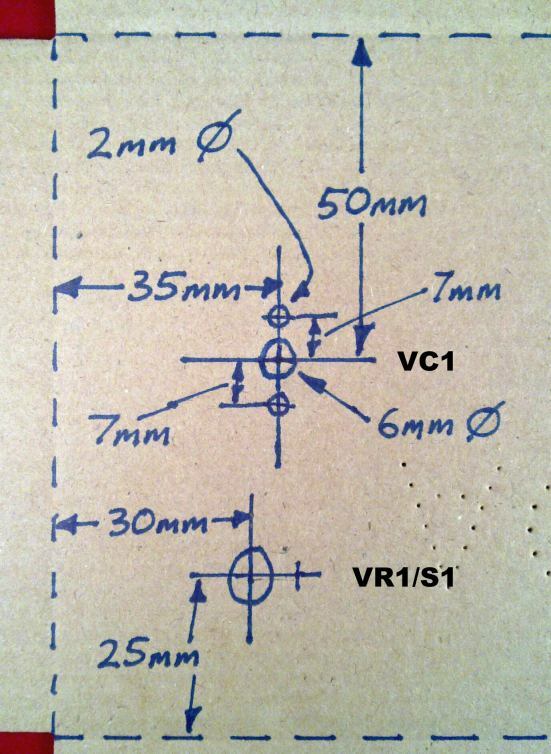 That's the end of the construction notes, and is as far as you have to read if you just want to build the radio. What follows is some more in-depth technical description and design philosophy discussion for the electronics engineers. After that there is a FAQ which may be useful if you're still having problems getting going, or if you've bought all your own components. 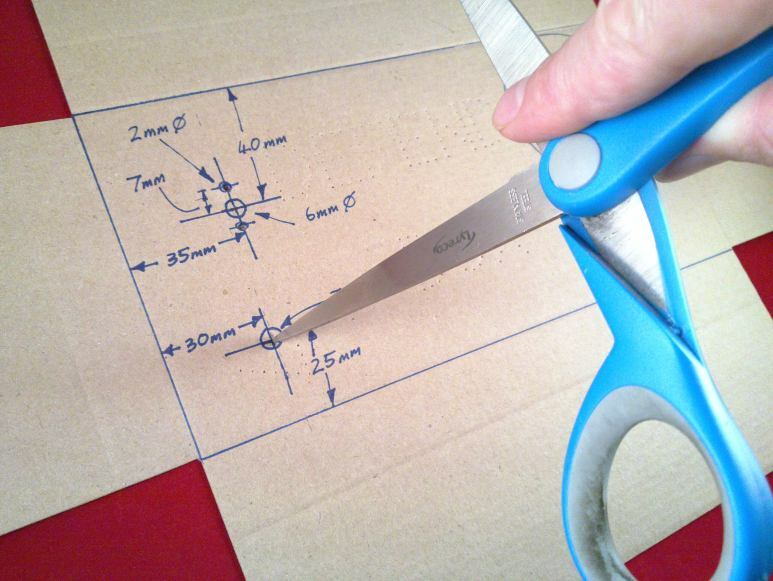 If you fancy trying some further modifications, there's a page with some ideas on too.